Front right pocket: The wooden and brass penknife is blunt on purpose, and I use it for cutting the glue on watercolour block. It’s a very specialised tool. It does also get used as a butter spreader in emergencies. 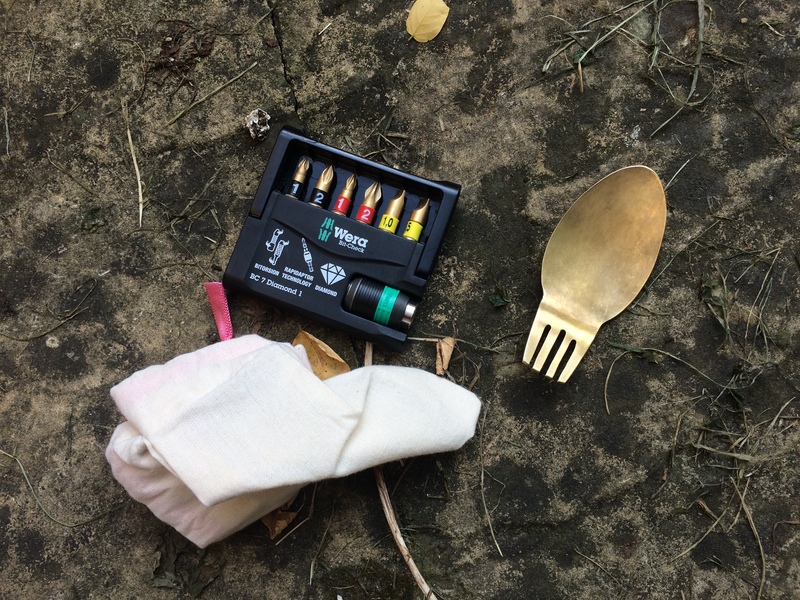 The tiny blue screwdriver set is from tinamous, a company run by a friend of mine. It’s got three bits in. I’ve ground down the smaller flathead so that it can repair eye glasses, and the small crosshead is a size smaller than the screwdriver set you’re going to see later. The larger flathead is about the right size for small choccy blocks and anything too small for my other set. The bigger knife is one I have to leave behind or put safely in my bag if I’m going out, but when I’m opening packages or need an emergency teaspoon, it’s vital. It’s by Webley, and I bought it because it opens easily with one hand, for when my other hand is full of something that needs cutting. I’ve replaced the rubber grips on the side, after they perished, with some leather that I superglued into place and then trimmed to profile. Occasionally I put some oil onto it, and I keep it pretty blunt, because it stays in my pocket when I’m at home, and a sharp knife can ruin both your day and your ability to bend your index finger. I also keep my change in this pocket. Currently I am low on cash. The dice are because I find them around the house from time to time, from gaming sets, and because they are a good demo piece for the Warco mill I sometimes teach on. If you can make one of those, you know a lot about how to make things. The bike light needs repair, as the rubber band has broken. 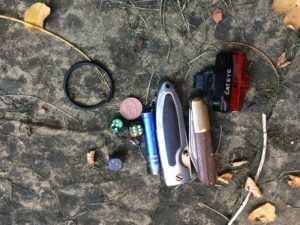 As it’s a small thing I’ve stuck it into my pocket to help me remember, and some day soon I’ll pick up a new rubber band. A rubber washer in the right size is ideal and much cheaper than the replacement part. 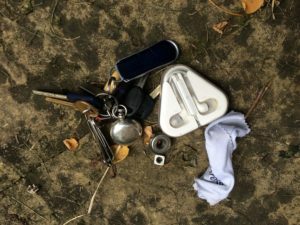 The left pocket has my keys, here carefully arranged so they cannot be 3D printed from an image of them, and a huge amount of data on the keyring. That silvery flash drive is pretty old now, but when I got it, it was the size of some commercially available drives. I have high quality images of paintings and I like things being backed up. The other drives do different work, and the /other/ silvery flash drive is usually a disk image, so I can deal with broken computers wherever I go. Not that I’ll admit to this, of course. Then, the glasses cloth is very useful for my specs, and I like being able to see. The headphones were a surprisingly good buy. In not having them tangled up and annoying me, and because they have a hard case that protects them, they have lasted literally for years. When the last set fell apart I took them back to the Apple store and explained the problem, and they just gave me a new set, so one purchase has lasted five years or so, and saved me a lot of money and aggro along the way. That’s a really good example of a thing I would buy again. The nail clippers are a single-use tool. I have very soft nails, and it’s worth having a thing to shape them so they don’t keep on breaking. 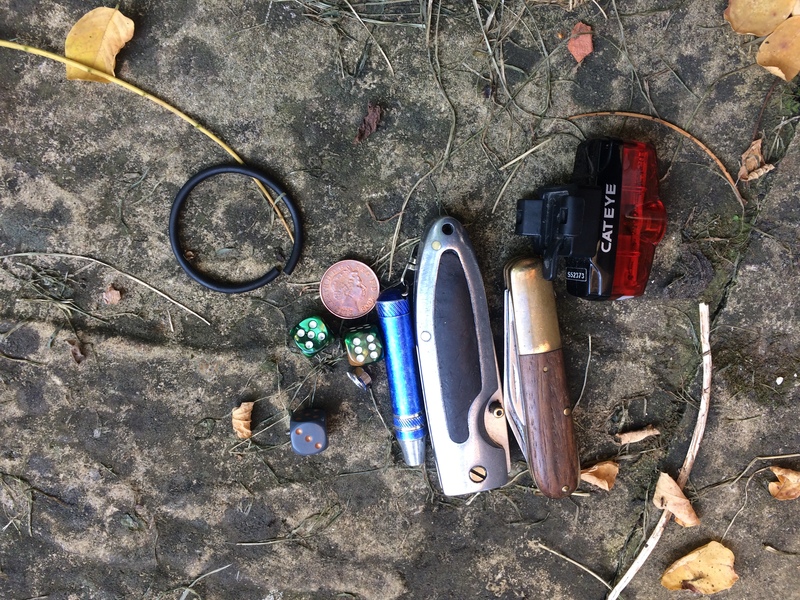 Things like nuts tend to accumulate in my pockets as I find them after I’ve tidied up. When I am in the right place and I remember, I unload them to wherever they go. The skate bearing is sort of a fiddle toy. The headphone package does the same thing for me, letting me keep my fingers busy while I stare at them and think. I don’t like fidget spinners, because the idea of spending money on things I already have annoys me. I’ll probably tidy away the bearing at some point, but I don’t have any that match it, and it’s not a size I tend to use, so I’ve got to find a place for it, and in the mean time it can keep me company. In summer I wear cargo pants, meaning I have thigh pockets. The right hand thigh has my brass spork in it. It’s more of a sp’rk, as it’s very short. I made it myself, and I think I should probably make a steel one, but the brass is fine for the moment. In the winter I’m in jeans and the sp’rk fits exactly over my right hip-bone, in the mini pocket there. The drill bits are 1/4″ and they come in a packet that has an impact driver protector with them – the green and black part. That will help protect the bits from the slamming action of a drill. I tend to use these as part of a hand screwdriver, but it’s worth keeping them in the packet and thus I keep the impact protector with them. The cloth bag is for a moon cup, because sometimes I’m female while on duty, but it’s not usually part of my carried kit. When I carry sharpies on me, they sometimes go in the right thigh pocket, hooked over the top, but I’ve never yet mastered not losing sharpies, so that doesn’t always happen. I tend to keep art-based things in a separate pencil case. My newest buy, and a very happy person I am too. 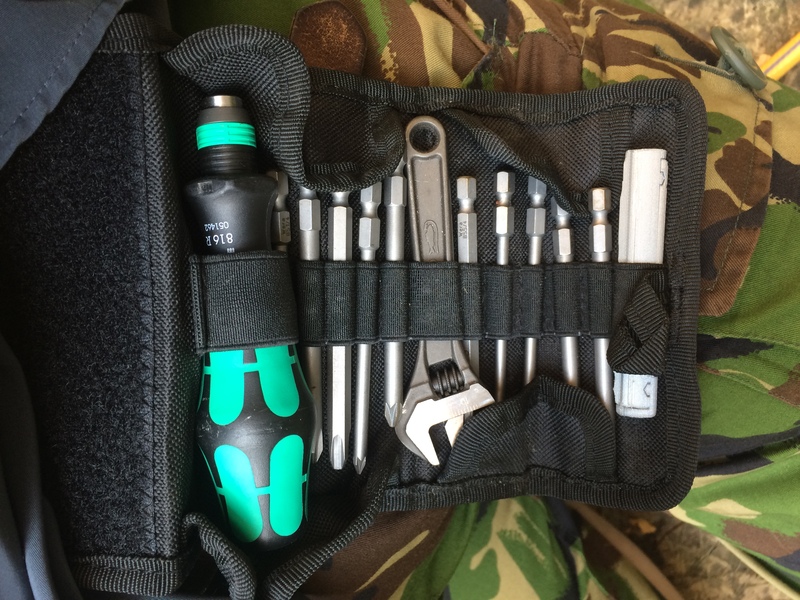 The Wera Kompakt kit sits on the left hand side of my belt. 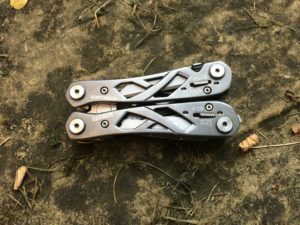 It has screwdrivers and a handle with 1/4″ drive, meaning those bits I already have in my pocket are suddenly very useful. There is a little overlap in sizes, and some torx drivers that I find useless and will probably be replaced with flat heads, but that doesn’t have to happen immediately. I’ve got Posidrive and Philips, and that covers most modern situations. It’s a great kit, improved by there being room to shoehorn a couple more things in. 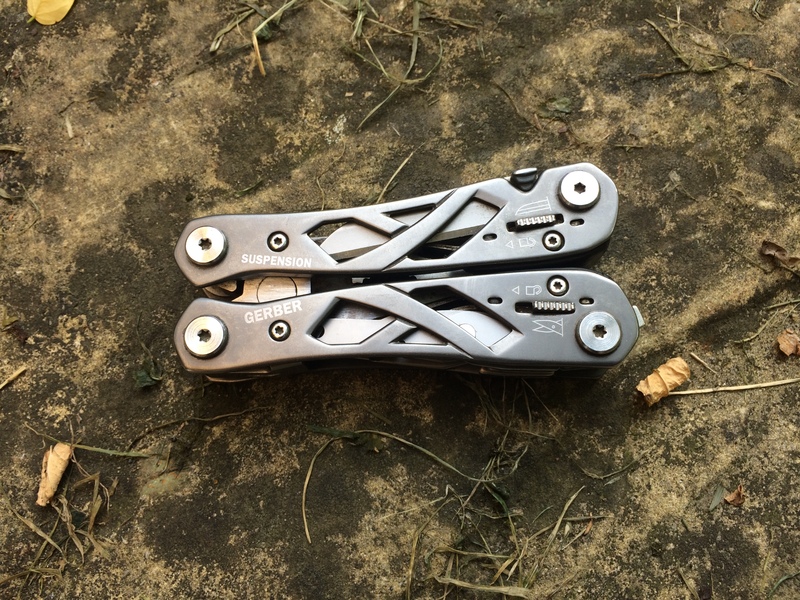 I’ve got a Bahco adjustable spanner, which is fantastic for holding nuts while the screwdriver is deployed. There’s also a 3D printed case which holds some Allen bits. 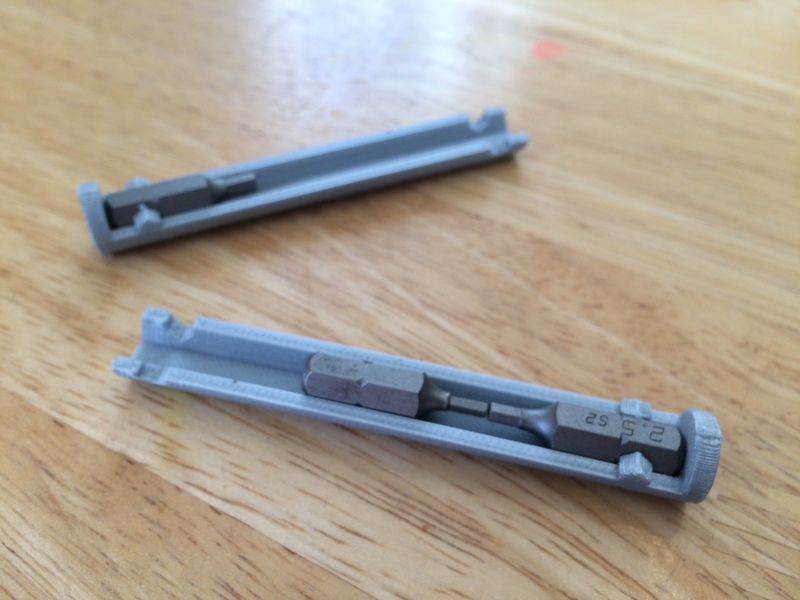 I have a lot of use for the smaller Allen key sizes, and given how tiny they are, I do keep dropping and fumbling them. Fishing a 2.5mm Allen key out of a full cup of tea was made all the more amusing by the fact that other people saw it happening and laughed as well, and I ordered a solution the next day. The drive bits are fantastic, but they are tiny so I 3D printed a case for them. The bumps that help it to fasten close also keep the bits at either end from drifting, meaning I can open it and there is only ever one loose one. I lever the thing open with a fingernail, but the next version of it will probably have some opening bumps. 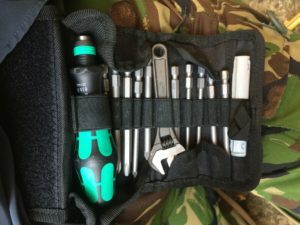 The case sits inside an elastic loop in the Wera case, and completes my on-me tool kit, at least for the moment. It would be hard to fit more on, as an other belt fittings would stop me from getting to pockets easily, or stop me from sitting down. However, with what I have on me I can do a lot of my tasks without even having to reach out for a tool. The main usefulness comes because I know where everything is, so I can reach for it automatically. Posted on 31st August 2017 31st August 2017 Categories LifeTags fun with a 3D printer, fun with knives, fun with tools, what has it got in its pocketsesLeave a comment on What has it got in its pocketses? I need to mess with the PID loop on the 3D printer. Right now it’s got about 12 possible temperature states in a look-up table, and that’s not enough. It needs 60, I think. The symptom is that the print never starts, and I believe that’s because the temperature never stabilises enough. If the change in loop doesn’t fix it, I’ll end up using an Arduino/Ramps combo, but I need to do this. I’ve needed to do it for about five months now. I do not want to flash that damned thing Yet Again. For one thing, it’s been months since I have and I’ve forgotten most of the steps. Update: Have accidentally ordered an Arduino Mega to go with the early RAMPS board I picked up. I was on eBay and it fell into my basket. I’ve printed out a holder for a new hot end, and a new extruder, and I don’t have room on my table to set up a 3D printer or do any soldering. No matter how much I tidy my room, it ends up with no visible floor. Much of this is for other people’s projects, and some of that I’m getting paid for, but it’s still a drag. Nevertheless, I put together a 3d printer extruder. Three times. Damnit. The kapton stayed on, which is great. I need to bind the thermistor in better, which I’ll do when it’s all cooled down again, but nothing broke. There’s a school of thought that says the hot end of a 3D printer shouldn’t be a solid block of plastic. After examination of both sides of the evidence, I have decided to subscribe to this. I bought a cheap 3D printer. Once I had bought it, I found out it was from clearance but had probably already been in some way paid for, which is annoying. Someone else didn’t get their machine, and while I know there is no direct connection between me having this and another, particular person not having it, I am still profitting in the cheapness of a clearance machine from the money that someone else put in. That aside, and it’s not a moral problem for me given the circumstances, I’ve now got a cheap 3D printer. The hot end, where the plastic gets melted, is famously terrible on this machine. It was a new design and tiny tolerances were needed, and it didn’t quite work. And also, I broke mine. So I’ve 3D printed a different big of plastic to hold a different head, and someone who was not using an old heater end and some other bits donated them, meaning I’m still getting a cheap 3D printer rather than an expensive time sink. It’s a cheap time sink instead. Currently bits of the hot end are cable tied together and the whole thing is about as shonky as a unicycle on a rocking chair.